Evangelina’s personal expertise in coding, design, branding and film/photography puts her in a position to create a website for a prospective client that not only looks beautiful, but meets their strategic needs as well. One of the benefits of working with Evangelina is the time you will save thanks to her experience with Squarespace and knowledge of website best practises. Building a website can be overwhelming and is much easier if there is a well-honed process in place. Evangelina walks clients through her process, start to finish, to give them a preview of what it’ll be like to work with her, and the clarity she will bring to their vision. If you wish to continue with Evangelina’s services, she will be providing a Project Form which will give you a better sense of the structured process. Evangelina designed and branded the official website for Ashtanga Yoga Nicosia. The website was completed in 30 days and optimised for all tablets. Evangelina implemented SEO and applied CSS/HTML customisation to meet her client's needs. Evangelina also written the about section of the website by interviewing Arita Kriticou Potamitou. 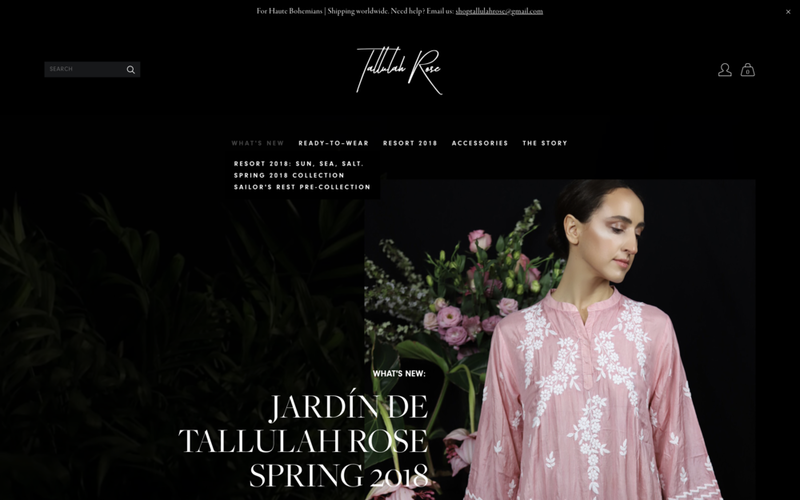 Evangelina designed and branded the online store for her own clothing brand, Tallulah Rose. The website is optimised for all tablets. Evangelina designed and branded her online portfolio, showcasing a selection of her work so far.